Indian Bank Recruitment 2018 - Apply Online for 145 Specialist Officer SO Posts of Assistant General Manager, Assistant Manager, Manager, Senior Manager, & Other Posts in Indian Bank, Tamil Nadu. Online Applications are invited by Indian Bank from 10 Apr 2018 to 02 May 2018 for 145 vacancies. Indian Bank SO Interview Call Letter 2019: Indian Bank has issued the Admit Card on 11 Jan 2019 for Indian Bank SO Exam 2018. Indian Bank Specialist Officers SO Exam 2018 Result with Marks 2019: Indian Bank has announced the Result on 09 Jan 2019 for Indian Bank Specialist Officers SO Exam 2018 which was conducted on 16 Sep 2018. Pay the Examination Fee through Debit Card, Credit Card, Net Banking or Pay Offline Through E Challan. Professional level certification in System Administration. 10 years Experience in maintenance and Administration of Operating Systems, Databases, Backup Management and Data Centre Management. Professional level certification in Database Administration. 7 years Experience in maintenance and administration of databases like Oracle/ DB2/ MySql/ SQL Server. Associate level certification in Database Administration. 3 years Experience in maintenance and administration of databases like Oracle/ DB2/ MySql/ SQL Server. 7 years Experience in maintenance and Administration of Operating Systems. Associate level certification in System Administration. 3 years Experience in maintenance and Administration of Operating Systems. 5 years Experience in maintenance and Administration of Middleware. 7 years Experience in application design, code review and Documentation. Certification in Big Data/ Analytics/ CRM solution 7 years Experience in Analyzing data, uncover information, derive insights and implement data-driven strategies and data models in Big Data/ Analytic/ CRM technology. 10 Senior Chief Manager - III 3 years Experience in Analyzing data, uncover information, derive insights and implement data-driven strategies and data models in Big Data/ Analytic/ CRM technology. Certified Information Security Manager/ Certified Information Systems Security Professional. 7 years Experience in implementing security improvements by auditing and assessing the current situation; evaluating trends; anticipating requirements and making relevant configuration / strategy changes to keep the organization secure. Checkpoint Certified Security Expert /CISCO Certified Security Professional. 3 years Experience in implementing security improvements by assessing the current situation; evaluating trends; anticipating requirements and making changes to keep the organization secure. Certification in software testing. Experience in Software Testing. Associate level Certification Virtualization Technology. 3 years Experience in Administration of systems in Virtualized environment. Nil 5 years Experience in conceptualizing, designing and implementation of High-value organization level IT projects. 19 Senior Manager - III It is desirable to have certification in Data Centre Management. 5 years Experience in Managing Data Centre Operations. 20 Manager - II Cisco Certified Network Professional (Routing and Switching). 3 years Experience in Network Trouble-shooting, Network Protocols, Routers, Network Administration. Certification in Cyber Security from a recognized institution. 7 years Experience Managing Cyber Security Operation Centre. 22 Senior Manager - III 5 years Experience Managing Cyber Security Operation Centre. Educational Qualification (For Post Code 23, 24, 25, 26, 27) : B.E/ B.Tech Degree or Post Graduate in Computer Science/ Computer Technology/ Computer Science & Eng/ Computer Eng/ Computer Science& Tech/ IT/ Electronics & Communication. CISA/ CISSP/ CISM Certifications are desirable. 5 years Experience in BFSI sector in handling various information security related roles like Firewall Management, IPS Management, SIEM administration, Antivirus Management. 3 years Experience in BFSI sector in handling various information security related roles like Firewall Management, IPS Management, SIEM administration, Antivirus Management. Certified Cyber Forensics Professional (CCFP) / Computer Hacking Forensic Investigator (CHFI) holders are desirable. Minimum 3 years experience in 1. Conducting forensic process on a variety of digital media 2. Creating detailed notes on processes undertaken and developing forensic reports in support of counter-intelligence or criminal investigations and other types of inquiries. Should possess Certified Ethical Hacker (CEH) Certification Desirable to have CISA / CISM / CISSP certification. Minimum 3 years experience in BFSI sector or in any other industry in handling various Ethical Hacking and Penetration testing related work including identifying security risk and development plan, application security testing related roles, conducting VAPT for web app under OWASP Top 10, well versed using tools like Nessus, NMAP, Metasploit, Burpsuite, Acenetix, Checkmarx and Penetration tools like KALI LINUX. Desirable to have CISA/ CISM/ CISP certification and knowledge of SDLC Cycle, Web development experience in the application of standard software development principles. Educational Qualification (For Post Code 28,29,30,31,32,33,34,35 and 36) : Full time - 2 years - MBA (Finance) / Post Graduate Diploma in Banking/Trade Finance/International Business from a recognised Institute/University approved by Govt. of India. It is desirable to have a certificate in compliance related courses. Minimum 5 years experience in Trade Finance in Banks/ Financial Institutions like Exim Bank/ ECGC/ FEDAI, Large Corporates handling Import/ Export business and Export houses. Nil Minimum 5 years experience of Handling a research desk independently. Minimum 5 years experience of Handling a research desk independently. Minimum 3 years experience of Trading in Equity Markets in Banks / Mutual Fund / Investment Banking. It is desirable to have Diploma in Treasury & Risk Management. 34 Manager - II Minimum 3 years experience of Trading in Forex Markets in Banks / Corporate / Export Houses / PSU. It is desirable to have the certificate in CDCS. Minimum 5 years in Trade Finance. Nil Minimum 5 years in Trade finance and Forex. Minimum 5 years experience of Handling a credit desk in Banks / Corporate / PSU/ Rating agencies It is desirable to have hands-on experience in assessing investment proposals / Fixed Income and Structured Instruments. 2. Two years full-time regular MBA/ PG Diploma in Banking / Finance/ MSc in Statistics from any University / Institution recognized by Govt. of India. 5 years Experience in banking. 39 Manager- II 3 years Experience in banking. Graduate in any discipline from any University recognized by Govt of India. Minimum 5 years as a Commissioned Officer in the Indian Army/Navy/Air Force OR a Police Officer in the rank of Inspector and above OR An Officer of identical rank in Paramilitary Forces. ICWA/ CA/ 2yrs Full-time MBA (Specialization in Banking and Finance). Desirable to have certification in Credit program from NIBM, IIBF, Moody's, IIBM, NISM, KPMH etc. 5 years Experience In Processing / Appraisal of Corporate Credit / Credit Syndication at Corporate / Head Office level of Public Sector Banks / Private Sector Banks / Financial Institutions. 42 Manager- II 3 years Experience In Processing / Appraisal of Corporate Credit / Credit Syndication at Corporate / Head Office level of Public Sector Banks / Private Sector Banks / Financial Institutions. Full-time PG Degree in Statistics /Applied Statistics/ Econometrics from University / Institute recognised by Govt of India Minimum 3 years of experience in the field of statistics. B.E/ B.Tech in Electrical from University / Institute recognised by Govt of India. Minimum 3 years of experience in Electrical Engineering work/ Design works. B.E/B.Tech in Civil engineering from University /Institute recognised by Govt of India. Minimum 3 years of experience in Civil Engineering Construction/ Design work. i) Bachelor degree in Architecture from a University recognized by Govt. of India. ii) Must have valid registration of council of Architecture. iii) Must have knowledge of Auto CAD & shall be conversant with Govt. guidelines pertaining to procurement of works, goods & services. Middleware Administrator - Weblogic, Websphere, JBOSS, Tomcat, Apache, IIS. Scale-I - ₹23,700, ₹980/7, ₹30,560, ₹1145/2. ₹32,850, 1310/7, ₹42,020. Sclae-II - ₹31,705, ₹1145/1, ₹32,850, ₹1310/10, ₹45,950. Scale-III - ₹42,020, ₹1310/5, ₹48,570, ₹1460/2, ₹51,490. Scale-IV - ₹50,030, ₹1460/4, ₹55,870, ₹1650/2, ₹59,170. On the basis of Preliminary Screening Test and Interview. Eligible candidates may apply online at Indian Bank's website (direct link is given below) from 10th Apr 2018 to 02nd May 2018. 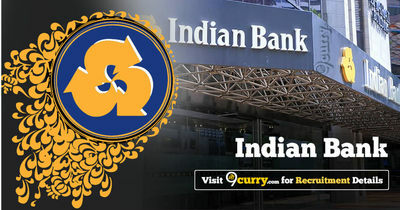 Candidates log on to http://www.indianbank.in/. Go to "Careers" & Select the desired post.